Listed below are some helpful tips on how to best use SensorCloud. Your devices list shows every WSDA and API device that you have associated with your account. To access your devices list, sign in and click the Devices link at the very top of the page. Owned Devices - Your owned WSDA and API devices. Shared Devices - Devices that other SensorCloud users have shared with you. Demo Devices - Example devices that are included with every SensorCloud account. Device - The ID and label for the device. Clicking on this will view the data for the device. Plan - The SensorCloud plan that is currently set for the device. Configuration - Enter the configuration page for the device. Last Heard From - The last time the device communicated with SensorCloud. Transactions - The number of transactions that have been used for the device in the current billing period. Total Data Points - The total number of data points that are stored in SensorCloud for the device. Each of your owned devices has a unique SensorCloud plan. The current plan for each device is listed in the Plan column of that device. The plan can be changed at any time by clicking on the current plan. This will open a window allowing you to choose among the Basic, Premium, or Pro plans. You can access the settings for each device by clicking in the Configuration column of that device. On the left side of the configuration page, you can view the device's information, change its label, and access the WSDA Control Panel and LiveConnect (for WSDA devices). User Access - Invite other SensorCloud users to have access to your device. Public Access - Make your device public so that anyone can view the data, even non-SensorCloud users! OpenData API Access - Allow SensorCloud's API to access the device using your credentials. Billing Alerts - Set up alerts to notify you when the device has reached certain quotas. Creating a custom View allows you to pull in individual channels from any number of devices. To manage your Views, switch from Devices to Views at the top of the Devices page. This will bring you to a page showing Views you have created (Owned Views), and Views that other SensorCloud users have shared with you (Shared Views). A View can be edited at any time to add and remove channels. Clicking on the name of the view takes you to view all of the data that has been added to the view. SensorCloud provides options for adding metadata, configuring channels, creating alerts, and more. To access these options, click the Settings button at the very top of the page while you are viewing data on the device you wish to customize. The Metadata tab allows you to add text and images to SensorCloud's FastGraph interface for the device. This can be useful for taking notes on the data, allowing team members with shared access to all have detailed information. The Nodes tab is used to configure individual sensors and channels. Setting labels and descriptions allow you to easily distinguish between sensors and channels. Checking the Hide box removes the sensor or channel from the FastGraph view. Each channel can also change from its currently stored unit to another similar unit type, adjusting the calibration coefficients that are applied to the data in the viewer. The Alerts tab allows you to add alerts for specific channels of data. Threshold alerts are sent when data exceeds a certain threshold. Inactivity alerts are sent when a channel doesn't upload to SensorCloud for a specified amount of time. These alerts can be customized to include any text that you want. Specific tags can be used to include information about the alert, such as the channel name, cause, and data value. To view the full list of tags, click the button in the Alert window. The Timezone tab is used to set the Timezone that was used when originally uploading data to SensorCloud. This allows the data to be viewed in various time zones in the SensorCloud viewer. FastGraph is SensorCloud's data visualization tool that provides exceptionally fast response, allowing you to navigate through massive amounts of data, and quickly zero in on points of interest. Sensors and Channels are shown to the left of the graph. Select the channels to view their data in the FastGraph window. You can pan left and right by clicking in the main graph and dragging the chart in either direction. You can zoom in on the data using the mouse wheel, or by holding the Shift key and left-click + dragging throught the time range of interest in the main graph. The bottom graph shows the entire overview of the data set that is currently graphed. Once zoomed in, you can pan by dragging the selection box around on this overview graph. Select the Download CSV button at the top of the graph to download the data that is currently viewed in the overview graph, or for an entire sensor. Select the MathEngine button at the top of the graph to perform math operations, such as FFTs and smoothing, on your data. To learn more, see the MathEngine page. A specific range of time can be tagged to easily highlight events and filter out less important data. To add a tagged session, zoom in on the time range that you wish to tag, select the All Data dropdown at the top of the graph and choose Tag New. A tagged session will now be listed in the dropdown which can be selected to only view that time range on both the overview and main graphs. The FastGraph viewer can be embedded directly onto your own websites with only one line of code (requires your device to have public access enabled). To learn more, see the Embedding FastGraph page. 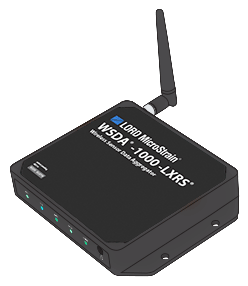 LORD MicroStrain's Wireless Sensor Data Aggregator, or WSDA, was designed to be a plug-and-play solution for collecting sensor data and pushing it to SensorCloud. LORD's wireless and inertial sensor networks send data to the internet-connected WSDA. The WSDA then sends this data directly to your SensorCloud account to be immediately viewed and analyzed. 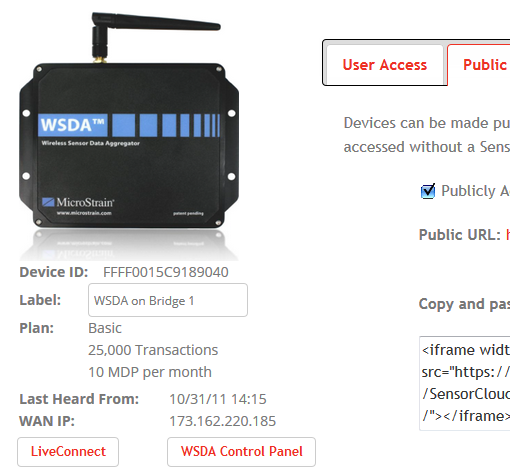 The WSDA optimizes sensor data prior to uploading to use as few transactions for your SensorCloud account as possible. Using LXRS® technology the WSDA can collect wireless data from a network of sensors that is lossless, synchronized, and can transmit up to 2 kilometers line-of-sight. To purchase or view more information on LORD MicroStrain's WSDA, please visit the WSDA page. Power the WSDA and connect it to an internet-enabled network connection. Log in to your SensorCloud account and go to the Devices page. Select the Add Device button. Enter the access credentials that shipped with your WSDA, and select Register WSDA. LiveConnect allows you to interact with your WSDA gateway and corresponding sensor networks from anywhere in the world, as if it was directly connected to your own PC. This allows you to configure your sensor network settings, start and stop sampling, and view real-time data - all remotely. LiveConnect works by establishing a virtual serial communications port between your WSDA and your local PC, regardless of where your WSDA is located. This virtual serial port can then by used by local PC applications, including LORD MicroStrain's Node Commander®, or from your own developed software applications. For details on how to use LiveConnect with your WSDA, see the WSDA Quick Start Guide[pdf]. 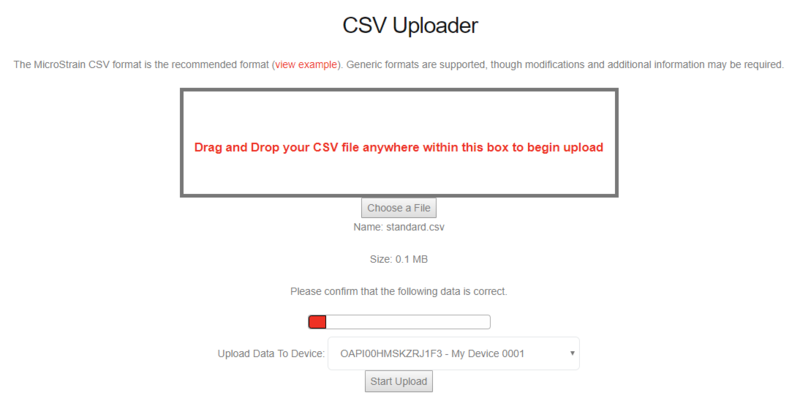 Another simple method of uploading data from various sources to SensorCloud is by using the CSV Uploader. Sign in and select the CSV Uploader link at the very top of the page. Drag and drop a CSV file into the provided box, or browse to it using the Choose a File button. The file will be parsed and a preview of the data to be uploaded will be shown. Select which channels you wish to upload by toggling the columns in the Confirm Channel Upload row. Choose the device you wish to upload the data to. Select Start Upload and the data will be uploaded to SensorCloud. The recommended format for your CSV files to be uploaded is the MicroStrain CSV format. An example of this format can be found on the CSV Uploader page. If the data is not in this format, you will be prompted to fill in information about the file so that it may be parsed correctly.